This is a beautiful classical Turkish designed villa with all the security and benefits offered by having a fully supported location. 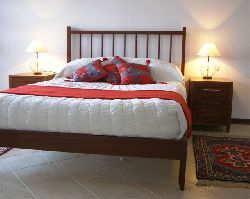 Two en suit bedrooms with double beds, toilet, hand basin and shower. Two further bedrooms with two single beds in each. Shared bathroom with hand basin toilet & bath with shower attachment. Three of the rooms have balconies. All rooms have individual air conditioning controls. Main living room has seating for eight with a two seater and two three seater sofas. The dining table seats eight. There is a further eight seater patio suite and six sun loungers. 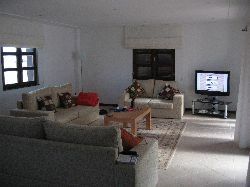 Facilities include, TV with several English speaking channels, DVD player, X-Box with several games, IPod stereo unit (no IPod supplied), Dish washer, Washing machine, fridge, freezer, Iron and ironing board, hair dryer, cleaning equipment, several UK plug options.+All you could need for a self catering holiday including towles and beech towles. 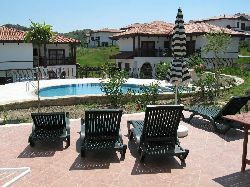 The complex has a pool bar with a restaurant and shops for essentials milk bread etc. There is a hairdressers and a tour operator on site. The pool bar overlooks the mountains across the large main swimming pool and offers wireless internet connection, Wi-Fi and Sky TV. The site has 24hour security and management. We can arrange airport pick up, hire car, laundry service (if required) and a cleaning service (if required). Excursions to the many beautiful surrounding attractions can be organised with Sam in the site office. There is diving available and I recommend the ship wrecks of Antalya. There are eleven golf courses within 30mins of the villa including the National (Home of the PGA Turkish Open) and courses by Faldo and Montgomery. On average playing one of these world class golf courses will cost around 75euro. Ancient ruins abound and an evening spent watching a show in a genuine Roman amphithecia is not to be missed. The site is 10mins from the nearest beach in Kumkoy which offers miles of sand and quiet away from it all seclusion. However the best beaches are in Belek and Side. These are 20-30mins away but offer restaurants and entertainment with parasailing, water skiing, and boat hire etc. Shuttles can be arranged on site to the beach of your choice. Personally I recommend Side with its stunning roman amphitheatre and crystal clear waters. Hireing a car at the airport is easy from 150euro for the week for a four door Fiat with air con. It is a very simple 45min drive to the villa which is sited just off the main D400 near Tasagil. Driving in Turkey is pretty civilised and finding places is reasonably easy. 20mins away are the beautiful waterfalls at Manavgat with its restaurants overlooking the river and the falls. A stunning place for an evening meal. The waterfalls at Antalya are 30mins away and provide charming walks along side the river and down past several smaller water falls. White water rafting is not to be missed as the scenery in the mountains behind the villa is epic.